Most popular commercial body care products contain dangerous chemicals that are harmful to our bodies. This has lead many people to opt for beauty and body care products made with clean, natural ingredients. Getting informed about what ingredients are in the products we use is important. For instance, when looking at the ingredients in our PRI Manuka Honey and Sea Salt Soap you notice Sodium Hydroxide (Lye) first on the list. Many would be shocked to find themselves using a product with Lye as the top ingredient. For many natural body care products the ingredients can be a bit misleading. In fact, there is no true soap without lye and there’s a huge difference between “made with lye” and “containing lye”. Don’t worry, the good news is that soap-makers rely on the chemistry behind the soap making process to produce an all-natural and effective product. Soap is the result of a chemical reaction called saponification that occurs between lye and a type of molecule called a triglyceride (a fat or oil), where both substances are chemically transformed, creating soap and natural glycerin. Neither of the original ingredients exists anymore. All the lye – sodium hydroxide for bar soap is consumed in the reaction. 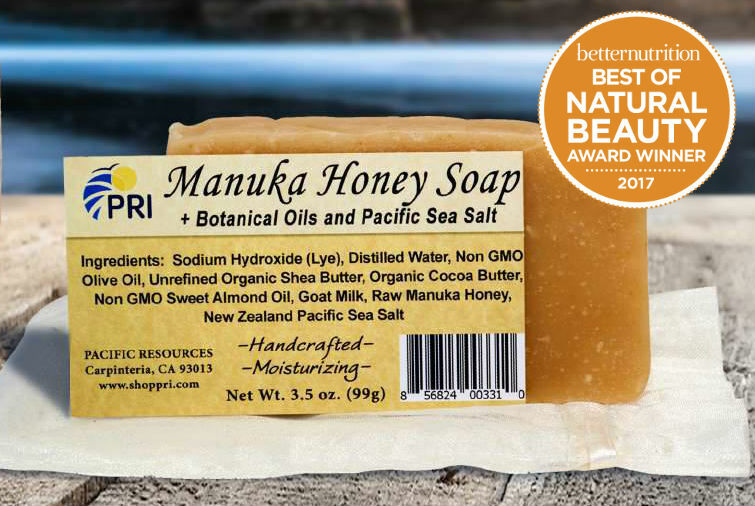 You can be assured that Pacific Resources’ Manuka Honey and Sea Salt Soap is the purest and most gentle on the skin. Here’s why: Think of hydrogen and oxygen. Left alone, these gases are very dangerous, but when combined in the right amounts (H2O) – you get water which is essential for life. Lye is an ingredient in pure soap. It is caustic, but when combined with the right amounts of oil and water, makes the purest form of soap. Soap that not only cleans, but leaves skin hydrated. Our Manuka soaps have additional oils to “super fat” the bars making them even more hydrating. Finally, Manuka Honey Soap has the added healing qualities of Manuka honey and the natural value of Pacific Sea Salt. So next time you use PRI’s Manuka Honey and Sea Salt Soap remember you are not using lye on your skin, you’re using soap. Previous Whats in Your Lube?